Our design/build team constructed this resort-style backyard by adding a vinyl pool with sweeping curves, interior stairs and love seat; a white pergola with 10”-round columns adds room-like feel to the patio. This eight-foot-high moss rock waterfall was built to ensure a perpetual resort feeling; a large berm has been planted with lush landscaping to add the right touches of color. 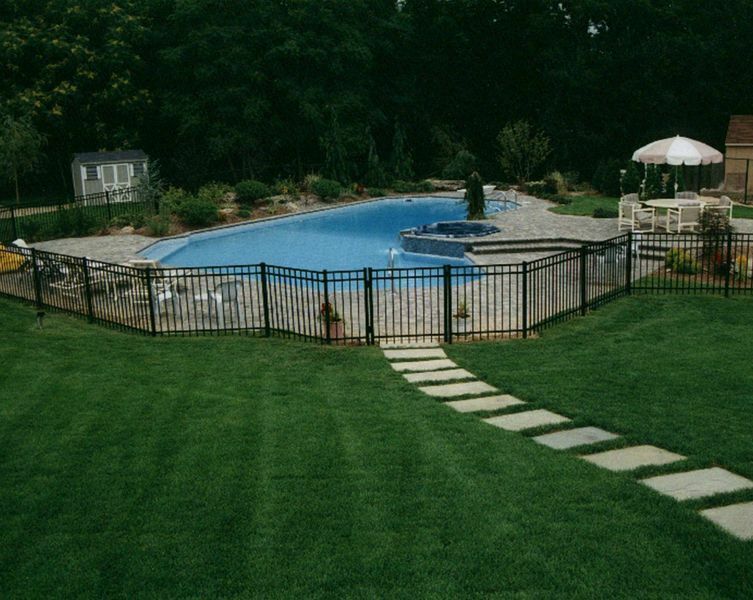 The owners of this Long Island property asked Deck and Patio’s design/build team to give their new pool area a “resort feel.” First, our team, under the leadership of our outdoor living expert Bill Renter, designed a vinyl pool with sweeping curves, interior stairs and a love seat. In addition, an eight-foot-high moss rock waterfall with two-horsepower pumps, that move 250 gallons of water per minute, were added to ensure a perpetual resort feeling. 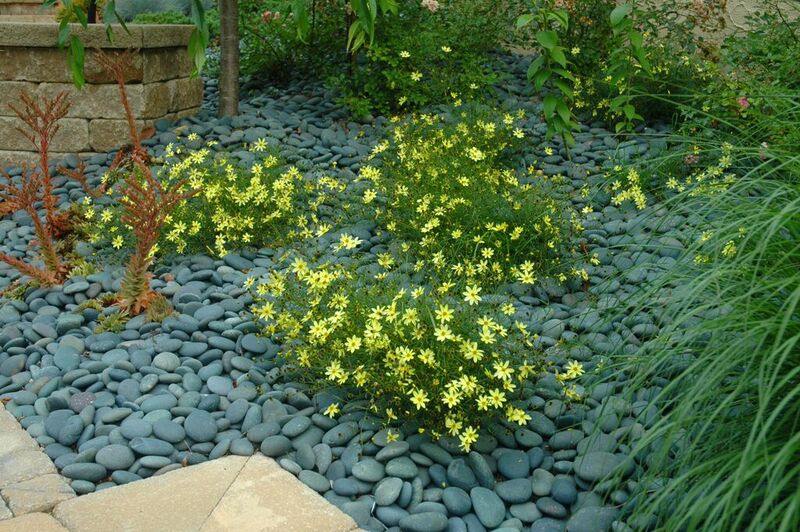 A large berm, complete with lush landscaping, added the right touches of color. The client’s new patio made of tumbled pavers gives the look of natural stone while staying cool in the warm months. A white pergola with 10-inch-round columns adds a room-like feel to the patio while adding height to the once flat looking backyard. The project was finished with landscape lighting which adds a sculpture appearance during the day while providing indirect lighting at night. Our expert team created an elegant multi-level deck to maximize the view of this new pool area. This project’s geometric vinyl pool was created with interior steps, love seats, an acrylic spill over spa, tile walls, and a multi-level patio. To maximize the view of the new pool area, for this showcase, our outdoor living expert and his team created an elegant multi-level deck which also enhances the traditional look of the sloping property. In order to match the gray siding on the house, we used a special splinter-free and slip resistant composite decking material in a similar color. Stairs, rails, benches and planters were also made from the same material, which offered the added benefit of not requiring preservation treatments. The spacious wraparound wide stairs were positioned to maximize the view of the pool area. The geometric vinyl pool includes interior steps, love seats, an acrylic spill over spa, tile walls, and a multi-level patio. An aluminum estate fence winds around the property, blending with colorful evergreen and perennial plantings. To complete the outdoor experience for these clients, an accessible cedar barbecue cabinet with a built-in stainless steel weber grill was installed close to, but out of the view from, the kitchen doors. 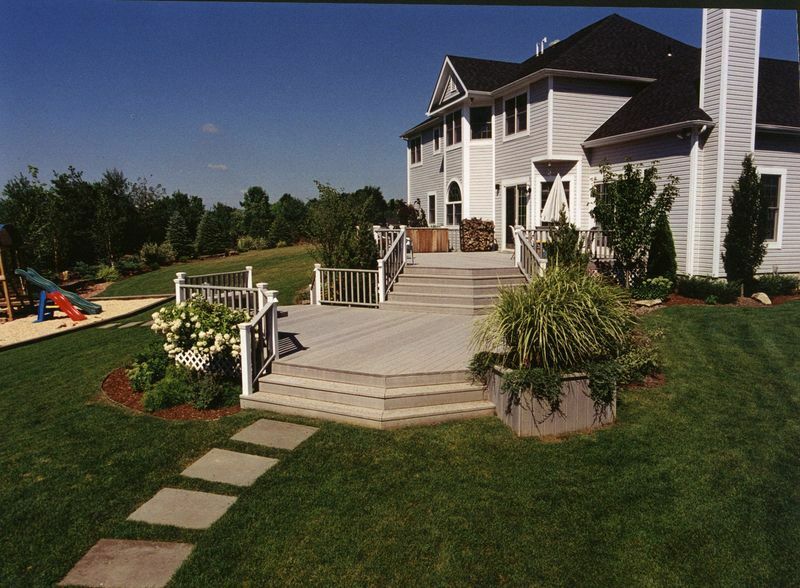 Stellar landscaping was also well planned to enhance the property’s scenic views. 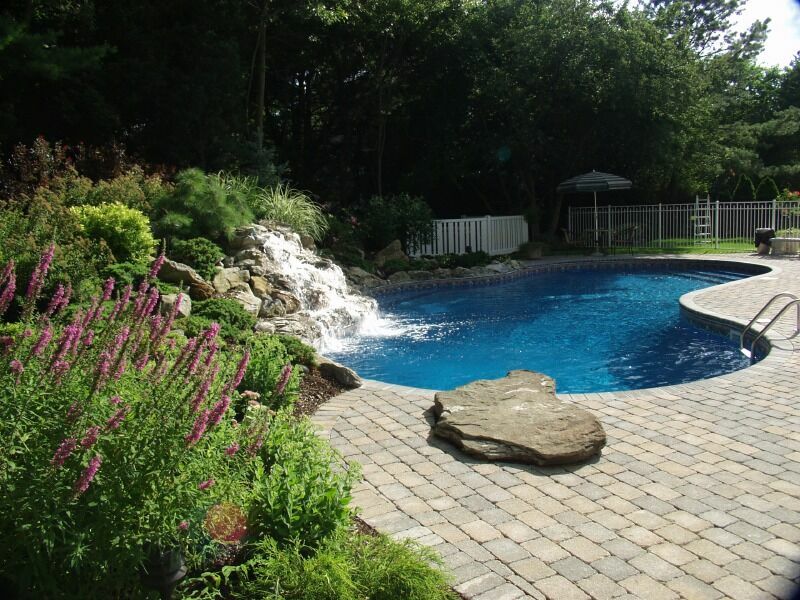 Bluestone stepping stones provide a delightful meandering pathway to the pool area. 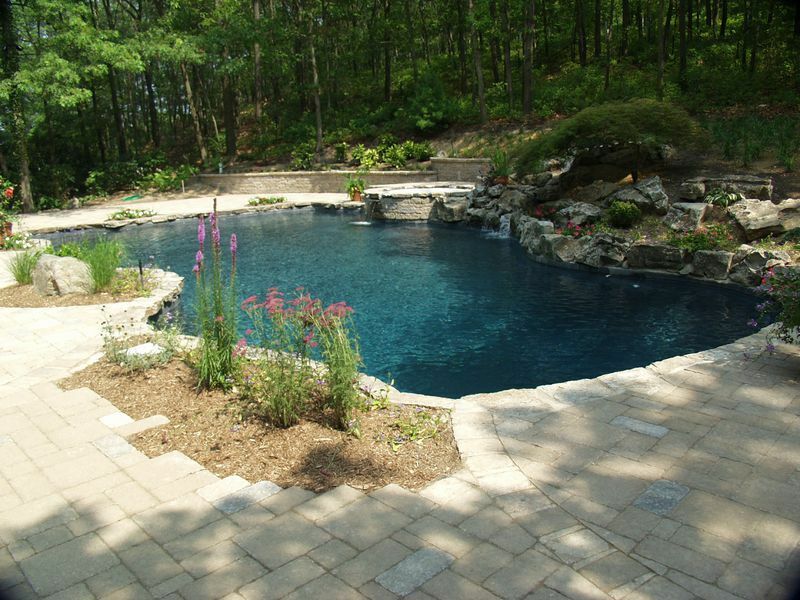 For this project, we upgraded an existing 22-year-old gunite pool and replaced uncomfortable grass with a new stone-like patio. We replaced a non-functioning waterfall and wood retaining wall, upgraded an uncomfortable existing spa with an acrylic spa and beautified the landscape with bright lush plantings. 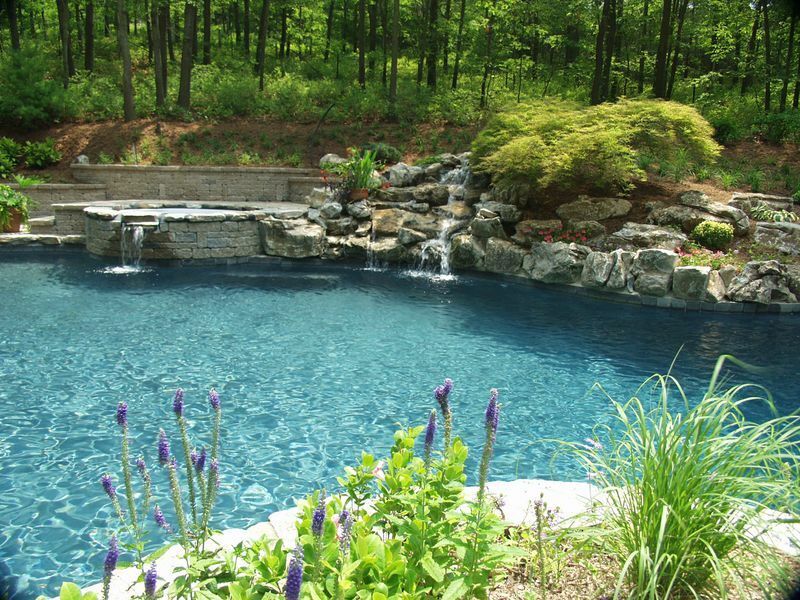 We were contacted by local clients who wanted their 22-year-old gunite pool upgraded. They also had a non-functioning waterfall, and were very unhappy with their backyard’s uncomfortable spa; an uncomfortable expanse of grass also badly substituted for a patio. wood retaining wall, and rock coping. Next, a new, and very comfortable, acrylic spa was installed. To retain the sloping woodland behind the pool and also to beautify the area, our team added a seven-foot-high moss rock waterfall and boulder coping. Because of the property’s natural setting around the pool, we gave careful consideration to which patio material should be used. 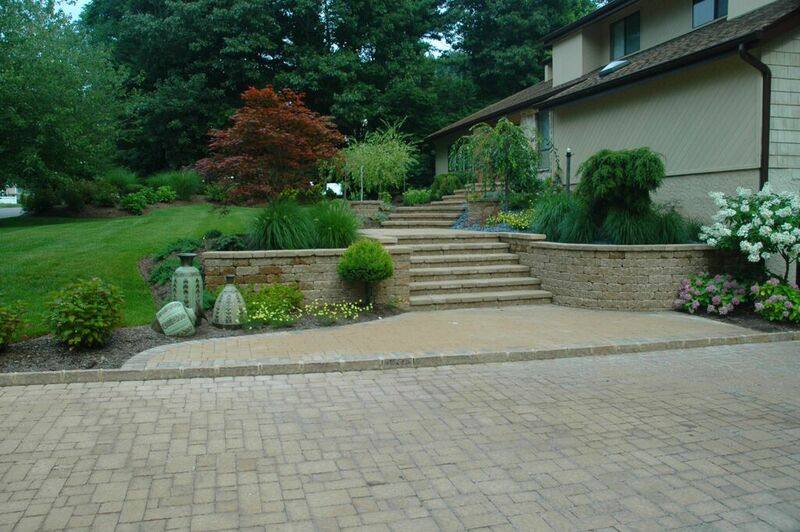 Our designers suggested a tumbled pavingstone and wall system made from Techo-Bloc. The color of the patio, which has the look of natural stone, is a blend of tan and natural gray, which ties in beautifully with the color of the boulders used. 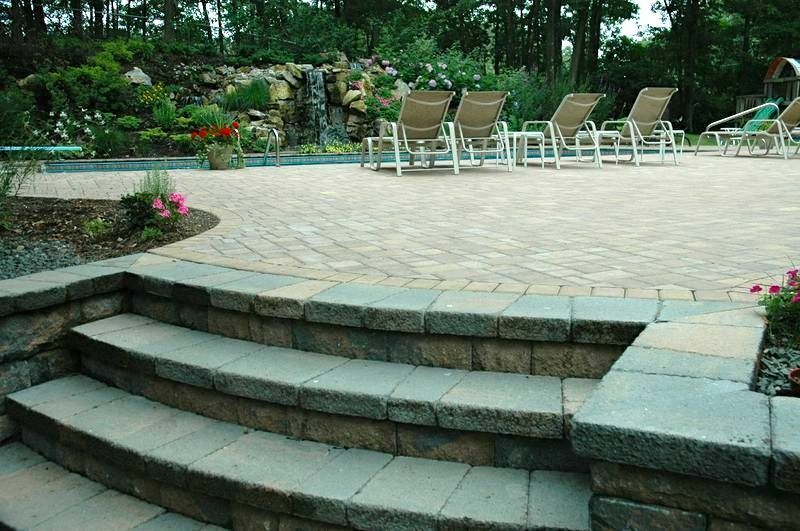 The patio remains cool even on hot summer days and has the durability of a paver patio. The new technology behind the paving and matching wall systems ensures a lifetime of easy care for these surfaces. The final touch was a lush and colorful landscape which was successfully accomplished despite the challenge of a mostly shady woodland setting. 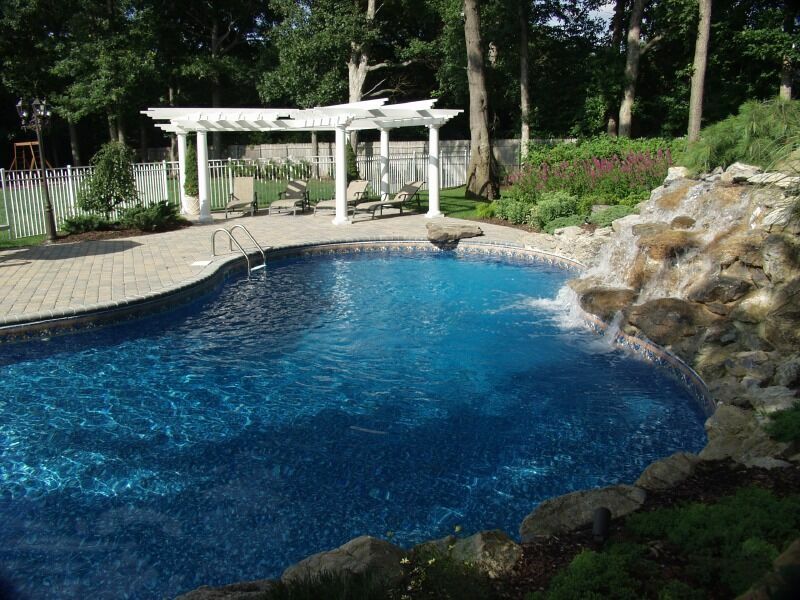 When this Dix Hills family decided to update their 1980s backyard pool area, they called on Deck and Patio’s outdoor living expert. The problem with their yard was their old wood deck and red brick patios were too small and unusable for parties and entertaining. 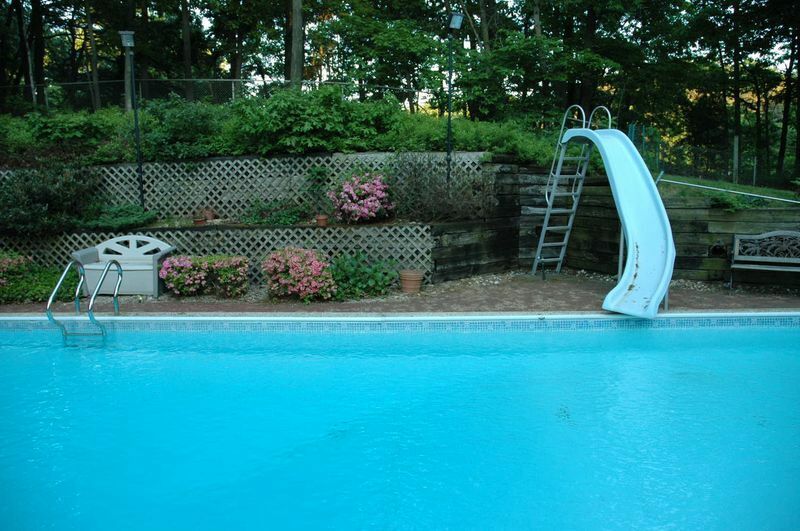 In addition, a large wood retaining wall beside the pool took away from the attractiveness of the pool area. 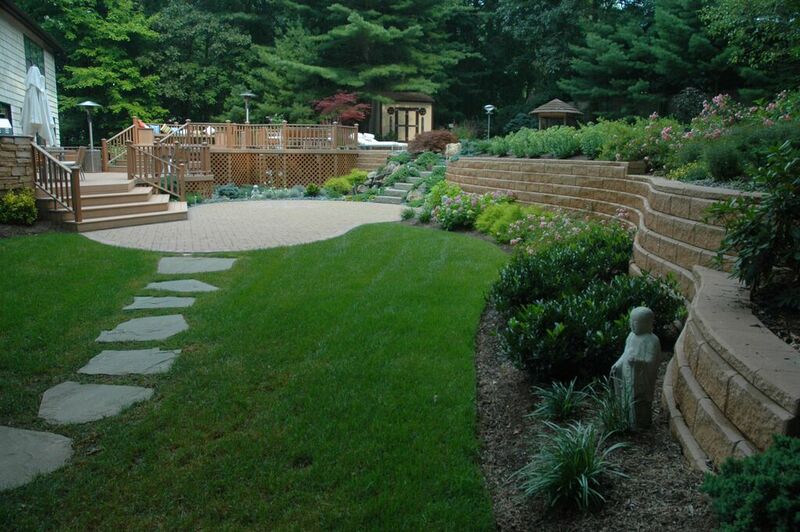 Our creative team introduced a unique concept to deal with the large retaining wall: re-grade the slope and create a large natural waterfall, stream, and woodland garden in its place. 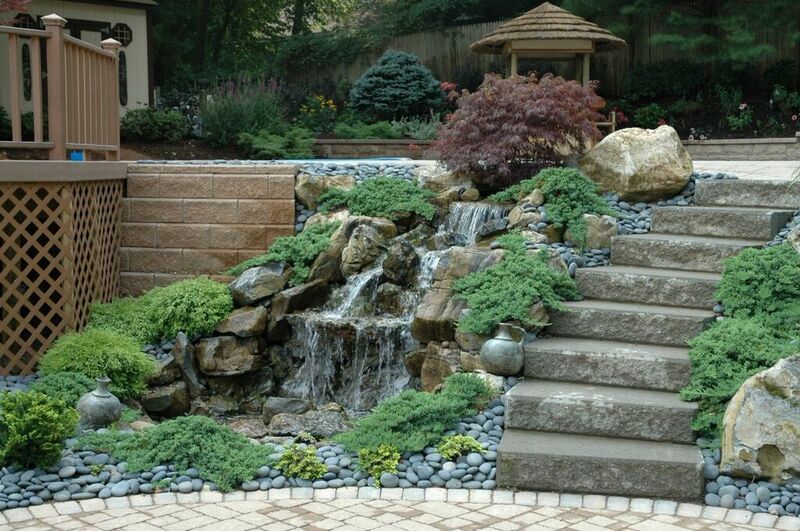 Our outdoor living expert chose Aquascape Designs’ pondless waterfall system to create a seven-foot-high “sheet” waterfall and stream, which requires a good deal of water volume to create a dramatic waterfall such as this. (Before photo) A key problem in the pool area was a large wood retaining wall away from the attractiveness of the pool area. After Photo: To beautify the area, we-graded the slope and created a large natural waterfall, stream, and woodland garden in its place. We chose Aquascape’s waterfall system because their focus, like ours, is on an ecosystem approach to water features — in this case relying on the most natural balance of circulation, filtration, plants, rocks and gravel to ensure sustainability. Another reason our waterfall retaining wall system looks so natural is our talented waterfall team understands how water flows over rock, how it releases from the rock in order to create a natural look and feel. We avoid the look of steps in the waterfall by making the water change directions in the waterfalls and streams. Our crew installed natural woodland plantings that tie in with the tall oaks on the property’s perimeter and also added evergreen shrubs to ensure year-round color. 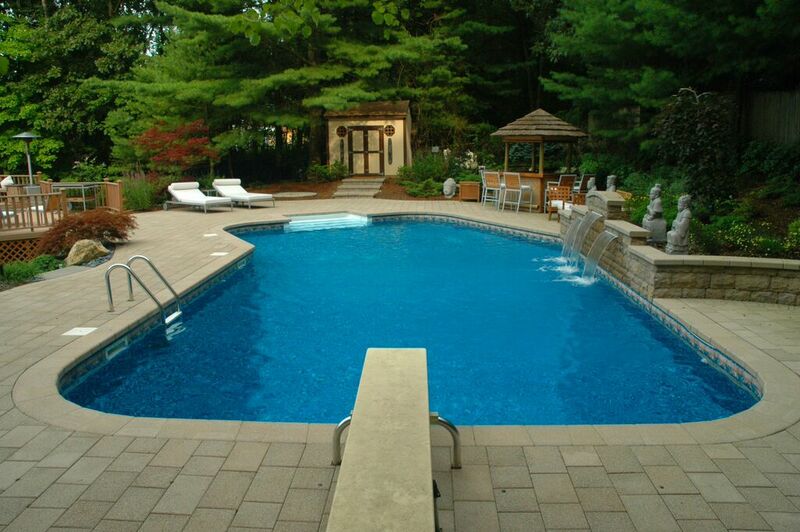 With the slope stabilized, our team addressed pool renovation. After draining the pool and removing the original liner, a poorly built concrete block wall was uncovered. The solution was to straighten the wall and fill the block in with concrete and steel rebars for strength. New vinyl covered stairs were then added, as well as new pipes, returns, skimmers, pump, filter and new liner was installed. This compacting process is not done by many contractors. We, however, have been doing it successfully for over 15 years with little or no soil movement. The idea is that using compacted soil the base will not settle, so you don’t have to wait to install a patio around a new pool. Many contractors still install concrete slabs under their patio. In our experience we find this does not work well. Settling still occurs under the slab allowing the patio to crack or settle. After the base materials were finished, we installed chestnut-hued durable pavers. These particular pavers have little or no color fade and the random design pattern adds interest to the patio. The pavers’ protective coating means these clients will have a clean-lined modern look. Even after being subjected to snow plowing, de-icing salts and normal wear, they will keep their color and beautiful appearance. The clients love their new patio and pondless waterfall. Not only do they find themselves outside more often enjoying nature’s sights and sounds, they have room for parties and entertaining. In fact, their perfect backyard was there all along — it just needed some expertise to bring it out. Our foyers and entrance halls make strong first impressions of the interiors of our homes. We sometimes forget, however, that the true first impression is happening outside. If our yards are outdated — even when the inside is fresh and up-to-date — the first welcome our home makes is not what we intend. 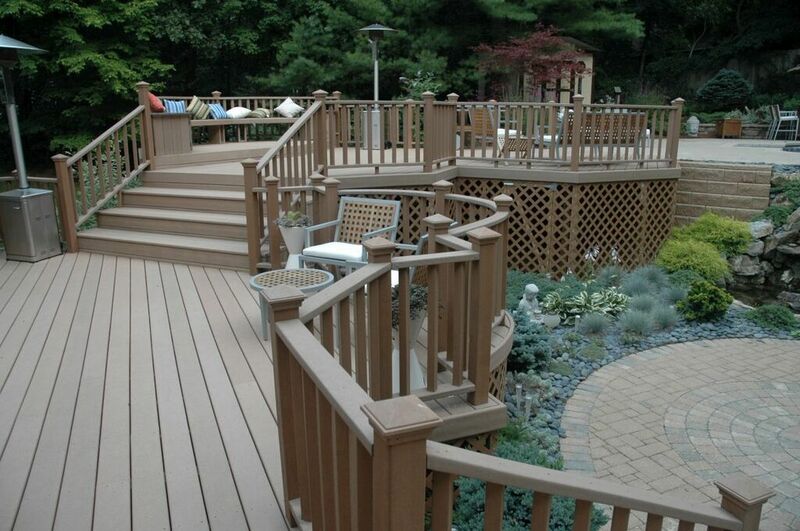 The homeowner’s initial thought was to only replace their backyard’s old decking with something more modern that suited their busy schedules; in other words, the new deck couldn’t be “high maintenance.” Our design/build team planned and executed the removal of the existing pressure-treated deck and replaced it with sleekly-designed Trex Accents composite decking, in “Saddle.” This new decking offers the warm, natural look of wood, but without the maintenance. Indeed. Trex being a composite fabrication, it eliminates the cracking, rotting or splitting natural wood is known for. It also requires no sealants which saves lots of regular maintenance hassles. These composite materials also protect from UV rays, and allow no damage from insects, water or sun. In sum: the new deck’s clean lines give a more modern and polished look to their outdoor space and are extremely maintenance-friendly. The new deck’s clean lines give a more modern and polished look to their outdoor space and are extremely maintenance-friendly. As the new deck was being completed, the design and build capabilities of Deck and Patio made a strong impression and we were asked to make a complete renovation of the remainder of the backyard as well as the front of the home. 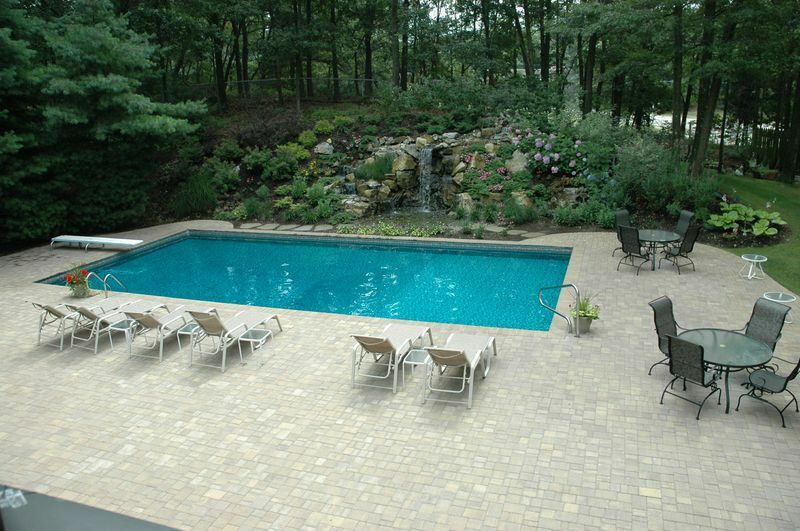 The patio surrounding the pool was given a fresh style by replacing the old tan Chanford brick pavers with the more modern and elegant look of Techo-Bloc’s “Hammered” tan pavers. Where there once stood a moss rock waterfall, we installed a sophisticated and elegant fountain style water feature with three spilling sheets of water. An old-fashioned, straight lined railroad tie wall was removed; it was replaced with a tan Allan Block wall, laid out in sweeping curves that don’t just define the space, but also soften the lines of their new relaxation spot. Deck and Patio’s outdoor living expert chose these blocks because Allan blocks look like natural stone; also they combine a rustic and modern aesthetic that result in an attractive contemporary look. In addition, they are also “dry-stacked” so there was no need for footings, mortar or connectors in the building process because the blocks stay in place once they are stacked together — — a real boon for cost-savings. Where there once stood a moss rock waterfall, we installed a sophisticated and elegant fountain style water feature with three spilling sheets of water. An old-fashioned, straight lined railroad tie wall was removed; it was replaced with a tan Allan Block wall, laid out in sweeping curves. 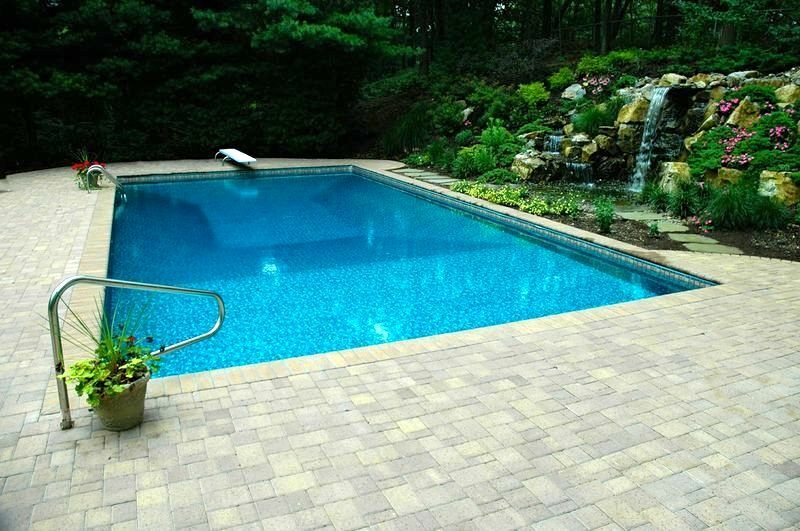 We gave a fresh style to the patio surrounding the pool by replacing the old tan Chanford brick pavers with the more modern and elegant look of Techo-Bloc’s “Hammered” tan pavers. With the backyard completely finished, the front required a bit of a makeover as well. The old, crumbling asphalt driveway needed serious attention. The Deck and Patio Company’s design required removing the old driveway and replacing it with durable tan Techo-Bloc. 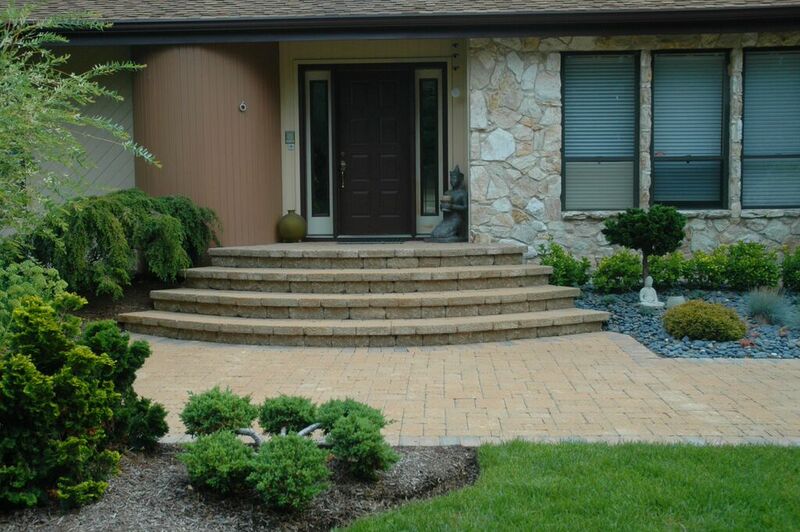 The asphalt walkway was also extracted and a series of graceful Techo-Bloc stairs and landings were installed. The beauty of the newly installed step and landing were subtly accented by a decorative circle kit giving a charming and aesthetically pleasing finish. Made of interlocking paving stones, the design offered warmth and charm in a design that perfectly suited the design of their home. Two final “hardscape” additions were the two sets of masonry light piers. The first set was installed at the end of the stairs creating a welcoming feature that would show off the fine details well after the sun went down. The second set of piers was set prominently at the end of the driveway to merely hint at the beauty of the property beyond. Now a matching driveway — up to the front door of the residence — offers a wonderful “first impression” that is fresh, new, and inviting. In the front yard, our design required removing the old driveway and replacing it with durable tan Techo-Bloc; the asphalt walkway was also extracted and a series of graceful Techo-Bloc stairs and landings were installed. The beauty of the newly installed step and landing were subtly accented by a decorative circle kit giving a charming and aesthetically pleasing finish. Finally, when it comes to updating a home, fresh gardening can raise a home’s value almost instantly and is the least expensive improvement you can make. For example, if your plantings are over 10 years old, they are probably way overgrown; any original landscape design has long faded when plants have grown practically into trees. For this project, our new “hardscape” design was tied together with lush, colorful perennials throughout and two specimens of green lace leaf maples standing alongside the light piers at the end of the driveway. In addition, a new pondless waterfall alongside the deck and pool area creates a luxurious and soothing highlight — an added bonus to their outdoor living experience. We also created a second lovely water feature area that appeals to the homeowner’s sense of sound as well as sight. When all the craftsmen packed up upon completion of the project, the homeowners were pleased with how their dream and the vision of their designer’s came to be a reality.